This movie was used to make you think about your present, your future and your choices. 1. What's your opinion about the movie? 2. If, in the movie, the pirate radio was way used to "talk hard". Nowadays, which would be the way to say what you really think? 3. The movie plot ran about the fight against the system. According to your sense about the system... what do you think it still wrong and how you could change it. 1. Why William was younger than his other classmates? 2. How William got interested in rock & roll? 3. For you, what’s the meaning of the phrase “IT’S ALL HAPPENING”. Who used it? 4. According to what you understood, what was the real function of being a “Band Aid”, like Penny Lane? 5. Why William’s mother was so overprotecting with him? 6. According to you, was Penny Lane really loved the guitar player (Russell Hammond)? 7. Why Russell, the guitar player, finally accept to publish everything? 8. What is the real name of Penny Lane? To whom did she say it? 9. William let him live his dream in the movie. What is your dream? and what are you doing to get it? 10. 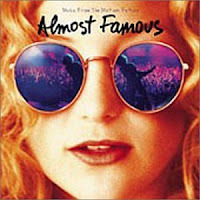 Why in the movie is used the name “Almost Famous”?